Perhaps because I first encountered it in audio format when it was BBC Radio 4's Book at Bedtime, Alex Preston's In Love and War has a certain dream-like quality for me. As a lover of historical fiction set in Italy during the second world war, this work of historical fiction set in Italy during the second world war ticks a lot of my boxes. I'm also an absolute sucker for maps in books, and In Love and War doesn't disappoint. Hand drawn in an art-deco style, the map shows Florence and the surrounding area on the eve of the Second World War, depicting the main geographical features of the city, as well as some of the particular places that feature in the story (including, for example, Villa dell'Ombrellino, St Mark's English Church and Villa Triste). 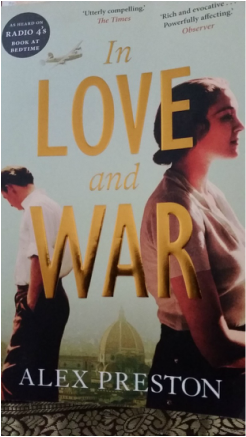 Based in Florence in the late 1930s, In Love and War tells the story of Esmond Lowndes, a confused young intellectual in wartime Florence. The supporting cast includes some well known historical figures (for example, Tour de France champion Gino Bartali, the controversial writer and essayist Norman Douglas; Alice Keppel, the former mistress of Edward VII and great grandmother of the Duchess of Cornwall; Diana Mosley, wife of the charismatic leader of the British Union of Fascists; and the controversial pro-fascist poet Ezra Pound). It also introduces us to some lesser known personalities, including the arch villain of the piece, Mario Carità, the feared head of the Florentine secret police (who was eventually hunted down and killed in a gunfight with American soldiers in Alto Adige in May 1945). Esmond Lowndes, the book's central protagonist, is a fictional character (although Preston suggests in his notes accompanying the book that Esmond may at least in part be based on a young Englishman who had come to Florence on the Grand Tour). Leaving Cambridge in somewhat dubious circumstances, Esmond is sent to Florence, with the backing of the British Union of Fascists, to set up a sympathetic radio station in Italy. The book is structured in five distinct parts. The first describes Esmond's flight from Cambridge and arrival in Florence. The second part chronicles the largely care-free life of the expat community in pre-war Florence. The city, though, is smouldering and this part ultimately ends in tragedy, as the dark realities of the fascist nightmare begin to take hold. Part 3 takes the form of Esmond's wartime correspondence, which heightens the book's sense of authenticity. Covering the period from October 1937 to August 1939, this section of correspondence brings us to the brink of war. This part again ends in personal tragedy for Esmond - the Party is well and truly over. Part 4 adopts the form of an audio diary which Esmond records as Florence descends into wartime chaos and the harsh realities of fascism are laid bare. It also records Esmond's growing infatuation with Ada Liuzzi, the striking daughter of the editor of the local edition of La Nostra Bandiera, the Italian Jewish-fascist magazine, and their tentative relationship. The final part of the book is pure page turning thriller, as Esmond and his lover Ada throw themselves into the work of the Resistance. With a rich cast of characters, an innovative structure and the incredible cultural and historical backdrop of wartime Florence, In Love and War, is a compelling and moving account of a tragic chapter in recent Italian history, in which the author conveys both the confusion and euphoria of youth alongside the horror and tragedy of war.